Too much fur? Brushing helps. Even if it feels as though there is still a ton of fur after brushing, brushing does help. There’s a build-up of shed fur which you’re picking away at. You’re like a miner excavating a tunnel. Can’t clear away all those rocks in one day! Don’t give up hope! Eventually you’ll brush away the built-up fur that has been sticking to your cat with the help of friction and body oil. Then all you need to do is keep up the maintenance. 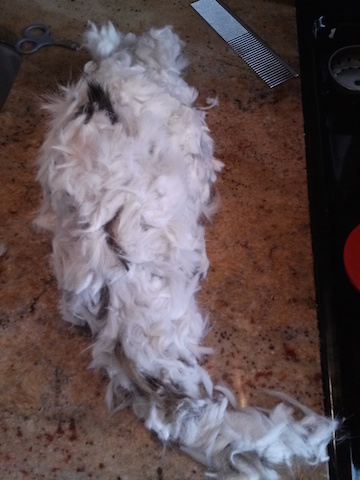 You can do it yourself or you can call a cat groomer. Either way works. You know what doesn’t work? Sitting around wishing that Fluffy wasn’t so fluffy. It takes action to get a reaction. Ha ha. 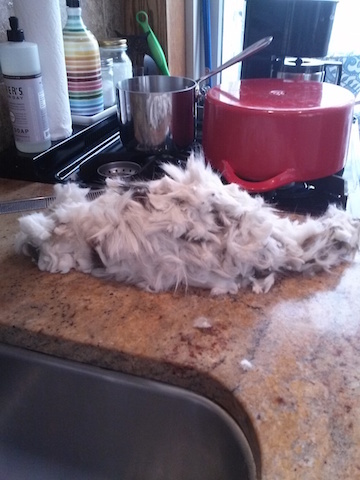 Fun client sculpted a “cat” using leftover fur from a lion cut. Cute! The real cat and the fake cat are about the same size. Really sweet cat who used to live on the streets of Brooklyn. Now he has the best life with loving owners.